Disc One: Chopin: Mazurkas (29) recorded between 1951 & '52. Disc Two: Chopin: Sonata #3 ('52), Waltz, Op. 18 ('52), Sonata #2 ('53) Nocturne, Op. 9 ('45); Mendelssohn: Song Without Words: The Shepherd's Complaint ('50); Schumann: Romance, Op. 28 #2 ('49); Mozart: Sonata #16, Adagio ('53). Disc Four: Prokofieff: Piano Concerto #3 with Antál Doráti conducting the Dallas Symphony Orchestra ('49); Khachaturian: Piano Concerto with Serge Koussevitzky conducting the Boston Symphony Orchestra ('46); Shostakovich: Préludes #14, 10 & 5 ('45). Disc Five: Beethoven: Piano Concerto #2 with Vladimir Golschmann conducting the NBC Symphony Orchestra ('46); Schubert: Moment Musical, D.780, #3 ('49), Waltzes, Landler and German Dances ('52), Impromptu D.935 #2 ('53); Schumann: Romance, Op. 28 #2; Brahms: Intermezzo Op, 116 #6 ('45); Liszt: Sonetto ('47) Hungarian Rhapsody #11 ('51) Mephisto Waltz #1 ('45). Disc Six: Bach: Partita #4 ('52-'53) Suite BWV 818 ('47); Scarlatti: Sonata, K. 380; Mozart: Sonata K. 570, Adagio ('49); Albéniz: Evocation ('45); Chasins: Piano Playtime ('52); Debussy: Children's Corner ('50-'51); Palmer: Toccato ostinato ('47). Disc Seven: Rachmaninoff: Sonata Op. 19 with Edmund Kurtz cello ('47); Brahms: Sonata Op. 120 with William Primrose, viola ('46), Sonata #3, Op, 108 with Jascha Heifetz violin ('50). Disc Eight: Frick Collection Copland: Sonata; Chopin: Nocturne, Op. 55 #2, Mazurka, Op. 33 #3, Polonaise-Fantasie Op. 61; Mussorgsky: Pictures at an Exhibition; Schumann: Kinderszenen (About Foreign Lands); Scarlatti: Sonata K. 380. ('53). Disc Nine: An Artist at Work. Alternate takes, etc. And interview. "It might have been… "
Before getting into the review proper, let me say that this set should be a required possession of anyone who claims to love classical music. 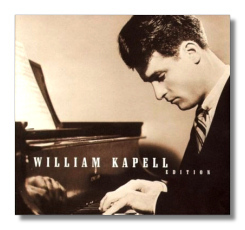 It is a must not just for lovers of Kapell, but of piano playing of classical music overall. I found the experience of reviewing these discs to be one of the most wonderful experiences I have had since beginning to study classical music through listening over 20 years ago. Listening to these discs you really wonder what might have been. I'd recommend this set just to get Volume Six. I am not really sure why, but this is the disc that I first really got into. I'd played a couple others, but that was not really listening. For some reason, though, this disc caught my attention immediately. It was probably the Bach. This is playing with soul! One of my listenings was done on a Sunday afternoon in early October. Our friends Bill and Mary Ann were visiting for lunch. * Bill and I were in the living room, looking at the leaves a changing, while the ladies and kids were outside. Bill commented that the Bach reminded him of Gould, and that comparison is more than apt. In fact, I wonder if Gould learned something about being Gould from Kapell. The playing has personality; it is musical. On reading Allan Evans' notes after writing this I noticed that he made a similar comparison with Gould. The Scarlatti that follows it is simply wonderful. The Mozart makes you yearn for a complete recording. The Albéniz is a bewitching evocation. I liked the Chasins much more than Mr. Evans (I can't understand why he felt the need to take a swipe at the music.) The four sections of his "Playtime" are: Waltz of the Rainbow, By the Brook, Dancing Bagpipes and Tricky Trumpet. It is really neat stuff and I am glad to be able to hear some of the music of an old acquaintance of mine. The Debussy is the finest I have heard, even more than Gieseking. I warmed to the Palmer piece after a few hearings. Frankly, I'd recommend this whole set just for Volume One. Wait a minute! I already used that phrase, didn't I? So it goes. Except for some Stokowski transcriptions or as parts of other piano programs, I was not previously exposed to the Chopin Mazurkas. What a wonderful experience! I now have to return to the Stokowski with these new ears. The insert notes mention that Kapell and Rubenstein "… met on many occasions and played various [Chopin] works for each other, including the mazurkas." To be honest, I find more delight in Kapell's Chopin than in Rubenstein's. The word "soul" appeared often in my notes as I listened to these discs, more so here than anywhere else. The notes also inform us that Jon Samuels, in the process of producing this set, discovered an unpublished mazurka and found missing minutes of another. By the way, the insert notes are very good throughout and provide a sort of biography of Kapell. On to Volume Eight! It may distress you that I am not discussing these discs in their order. One of the delights of writing reviews is exploring these gems. I can jump around as I choose and that is the order in which I am providing my insights to you. I actually played this disc second, but waited until later to write extensive notes. I made that decision because I wanted to compare the Scarlatti. It was an amazing experience and education! The Frick Collection recording is almost a minute faster than on Volume 6. The sound is also dryer, Kapell's playing more staccato. I don't like it nearly as well as the earlier recording. In fact, as a rule I found this disc less appealing than the rest and I think it has something to do with the sound. There's not as much reverberation as I like. That may be a personal reaction, however, which you may not share. There is a wonderful Mussorgsky "Pictures" and the Schumann is as haunting as you can imagine. I could do without the Copland, but in his interview on disc 9 the pianist calls the piece the finest of the 20th Century!!! Volume Four is actually the first disc I listened to and made notes about. In the scheme of things, however, the words didn't start to cohere until this point in my writings. Prior to getting this set, my only exposure to Kapell was a live performance of the Prokofieff 3rd with Stokowski and the New York Philharmonic. In fact, I was a bit disappointed that RCA chose the Doráti recording instead of the Stokowski. That is, I was disappointed until I heard the recording. The sound here is much better than on the Music and Arts release, revealing details missing in Fred Maroth's release. After several listenings I will say that Kapell plays the Prokofieff better than anyone I have heard and that includes all the big names. Doráti seems to produce a more idiomatic sound from the Dallas Symphony than does Stokowski with the New York Philharmonic (but that may be due to the distant transfer of the M&A disc). I'll discuss the Shostakovich Préludes when I get to Volume 3. The Khachaturian is typical Khachaturian. I don't care for it, but that is me. For what its worth, the notes say of the Khachaturian that the first movement of this recording, "… enjoyed a surprising success as a jukebox favorite." Go figure. On to, or back to, Volume Three. Both Rachmaninoff pieces are recorded with the Robin Hood Dell Orchestra. For those of you unfamiliar with that band, it is the Philadelphia Orchestra in Summer drag. Reiner leads the orchestra in the Paganini Rhapsody. Some of you may not know that Reiner worked with Stokowski and the Philadelphia Orchestra early in his career. This 1951 recording is spectacular. Nice details abound, not the least of which is Kapell's right hand pinkie. Add the lush sound of the Philadelphia (the Stokowski Sound maintained by Ormandy who knew better than to fix something that wasn't broke) and you have a masterpiece. The insert notes mention that Kapell played this piece shortly after Rachmaninoff died and the pianist cried though the whole experience. This recording of the Second Piano Concerto has become my personal favorite. It is similar to Rachmaninoff's recording with Stokowski, but it has Kapell's own voice as well. It has soul. Every time I hear the Rachmaninoff Prélude, I hear why Stokowski orchestrated it; it cries out for an orchestra, and this recording is no different. More Shostakovich Préludes follow. I took the opportunity to do some comparisons with #10 and #5 as recorded here in 1945 with the 1944 recordings in Volume 4. I prefer these later recordings. Number 10 is 9 seconds slower and that possibly contributes to a darker atmosphere. The left hand, in particular, adds a new dimension and, for some reason, I thought of Ravel's "Undine". What might have been? Listening to these Préludes in comparison is a lesson that teaches that music is much more than the notes, more than black marks on white paper. Volume Seven is the only disc I have some real reservations about and you may not share them. I confess that I have never liked Heifetz's playing (pace Jack Pfeiffer) and the violinist's insistence on having the violin much closer than the piano has a lot to do with my reservations here. Kapell is a perfect accompanist, but you really can't hear that much, despite transfers that attempt to realign matters. The alternate take, heard on Volume 9, of the adagio of the Brahms Sonata is better sounding and more emotional. The other Brahms piece, with William Primrose on the viola, is one of the worst sounding in the set. The viola, in particular, sounds wiry. On the other hand, Rachmaninoff's cello sonata is absolutely bonkers. I've heard this piece on a Chandos recording, but Kapell and Kurtz capture the essence of this moody music much better. In fact, this piece makes the whole disc worth having and you may not share my opinion of Heifetz, so enjoy! Volume Two offers even more Chopin. What I have said earlier about Kapell's playing of the mazurkas is echoed here. I was slightly disappointed in the broadcast recording of the Second Sonata, but that is because the sound is distant and grainy. The performance is from Australian radio tapes and may have been Kapell's final playing. He died 7 days later while returning from Australia. I thought I'd share a story about Kapell I heard from a friend. While in Melbourne Kapell stayed at the house of a prominent heart specialist who was very active in musical circles. They had a spacious home with a grand piano on which Kapell practiced daily. One day Kapell said, "If you want to be a really great pianist, you have to be able to sit down at the piano at 9 in the morning and not get up until 5 in the afternoon. And there's only two people in the world that can do that – that fool Horowitz and me." Volume Five opens with a classic performance of Beethoven's 2nd Concerto (actually his first). The recording is classical in interpretation and Mozart's later concertos come to mind. Of course Beethoven has his own stamp that differentiates it from the other composer. The second movement as played here is absolutely mesmerizing. It has a delicacy that is poignant. The Schubert pieces are, frankly, so wonderful that I began to recall Whittier's phrase that opens this review. The Liszt, oh, my God! At the end of each piece I wanted to jump up, yell Bravo and cheer. I restrained myself, however, since Susan would probably wonder even more about me. I was going to write that Volume Nine is probably for Kapell enthusiasts only. That is, I was going to write that until I heard the Bach Partita that opens the disc. Soul abounds in every note Kapell plays, even in these alternate takes on this disc. As I mentioned, I actually prefer the Brahms recording here over the approved one on an earlier disc. Listening to the interview with Kapell you realize that here was a musician who was also a philosopher. Kapell answers even the insipid questions in a way that reveal a great artist, a great musician. You will learn a lot just from listening to him. Towards the end of the interview Kapell says, "In front of a microphone it can usually take hours and hours before one could achieve the kind of communication which is readily accessible to the spirit in front of people, because the microphone is not people; and there occurs a mysterious act, which I like to call transference, in which the microphone suddenly becomes people. And when that happens, music comes out of the loudspeaker… When this transference takes place, suddenly you're filled with music, and you just play it into the microphone as if the microphone were a human being… The microphone ceases to be an object and becomes a means of going somewhere." Maybe this is why Kapell's playing has so much soul. Jon Samuels has done it again! He was the genius behind the Stokowski Stereo Collection. His work has produced excellent sound and he has discovered lost treasures for you, too. Enough said, go buy and enjoy. * Bill and Mary Ann Pomputius are friends who share a lot of our interests. We get together from time-to-time and talk about music, etc.